I’ve talked a little about fear, here on MBS. In the process of working through my fears, I had a breakthrough I thought would be useful to share. Whether you’re feeling: fear of failure, fear of judgement, or a fear that’s been created from something in the past… I think we all experience fear, sometime or another. 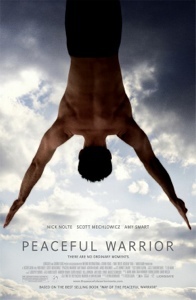 Coincidentally, I watched “Peaceful Warrior” the day before I had some of my own ‘fear’ come up. I started thinking about our fears and how to deal with them when they arise. Peaceful Warrior is an inspiring movie and some of the lines quotes really got me thinking. The idea behind this quote is that every moment is sacred and beautiful…and if we’re not in the NOW, we’re missing out on these moments. It dawned on me that this theory can be applied to our ‘fear’ as well. When fear comes up for me, it usually arrives in a worry-some thought or anxious feeling. The mind-chatter goes wild…and we are no longer in the present moment. Instead of allowing negative or fearful mind-chatter to take over, try refocusing your thoughts and attention on the things you’re grateful for. Cuz, if you really think about it – we’re all so lucky to be: healthy, safe, alive….. Everyday, every moment ~ there are examples. I think fear relates to vulnerability as well. If we open our hearts and look within, we can learn so much. 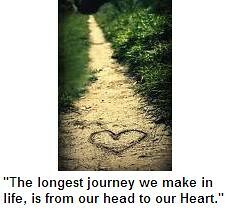 If we open our hearts to others, we can create: expansion ~ growth ~ love. This movie reminded me of the magic in life and the significance of being in the present moment. One way we can do this is to start a Gratitude Journal. Jotting down the things you’re thankful for will bring you into the now and shift you into a positive perspective. So, open your heart to your fear. Give love to your fear. Listen to it. What is it saying? ~ I am grateful for you. ~ I am grateful for my teachers. ~ I am grateful for being able to share this. P.S. I’d love to hear your experiences and/or info you think might be helpful.